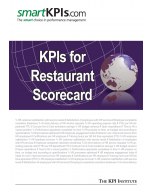 The Restaurant Scorecard is a ready-to-use tool, pre-populated with KPIs preselected by the smartKPIs.com researchers, grouped by objectives and Balanced Scorecard perspectives. 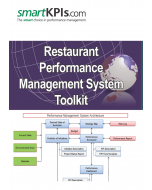 It illustrates the application of the BSC concept at strategic level and can be employed as part of the restaurant performance management system. As a performance management tool it assists in monitoring the alignment of organizational objectives with KPIs and in tracking their achievement. - Customer: how do our customers see us? - Financial: how do we satisfy the financial expections of the shareholders? - People, Learning & Growth: can we continue to improve and create value? Helicopter view data - contains the performance indicators that offer a broad perspective on the restaurant's activity and status, such as the average of a main menu. 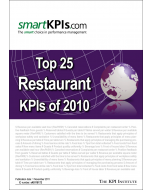 Aligning the activities within the Restaurants and the pursuit of the organizational strategy. 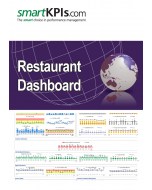 Buy now the Restaurant Scorecard and benefit of this valuable resource immediately by downloading it electronically upon checkout!